Mitsubishi gives away Colt CZCs | What Car? 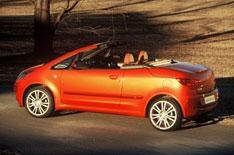 Mitsubishi is giving away one of its Colt CZC coupe-cabriolets every weekend until the end of March. The competition is open to anyone who test drives any Mitsubishi on any weekend during that period. Their names will be entered into a competition to win a new Colt CZC. Mitsubishi is running the competition to promote its price changes late last year, when the price of a new Colt CZC 1 fell from 14,026 to 10,174.